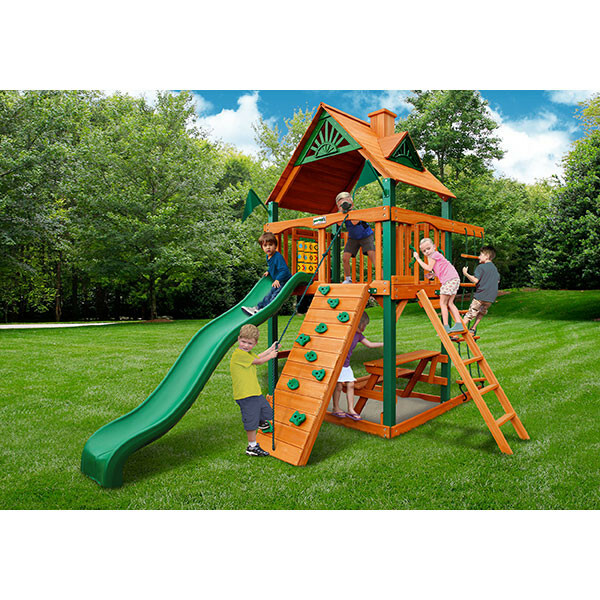 Created for those with limited space or for those who just aren’t into swinging, the Gorilla Playsets Chateau Tower is just that, a playset tower filled with lots of fun and features. 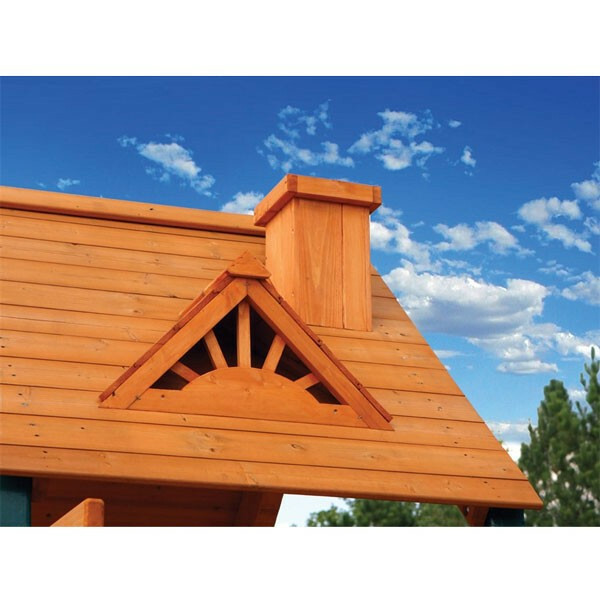 The Chateau Tower is built around four sturdy 4x4 beams that come in either an amber wood finish or the Timber Shield coated finish for more protection from weather and other elements. 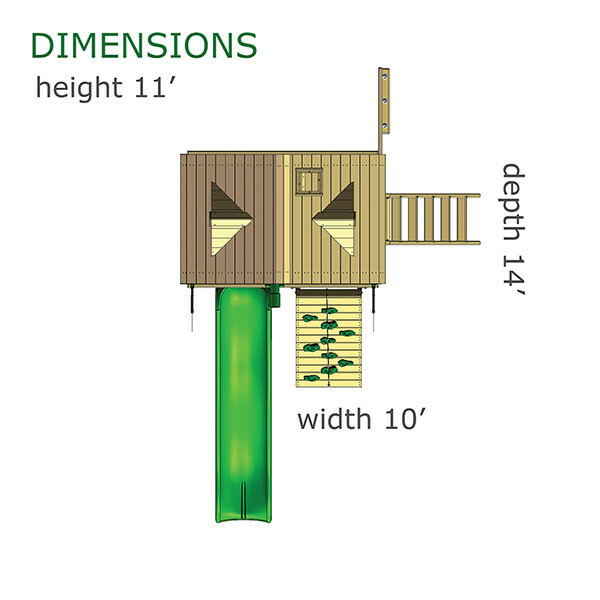 The tower platform is 5’ high and is ready for climbing and imaginative adventures. Kids will love climbing to the tower using the rock wall and climbing rope or the safe entry ladder. The deluxe rope ladder also tests their strength and climbing skills. Once inside the tower, imaginations will take flight with the play telescope, steering wheel, and tic-tac-toe panel. Below deck kids will find a built-in picnic table and space for a sandbox. The wave slide provides a quick ride back to the ground. 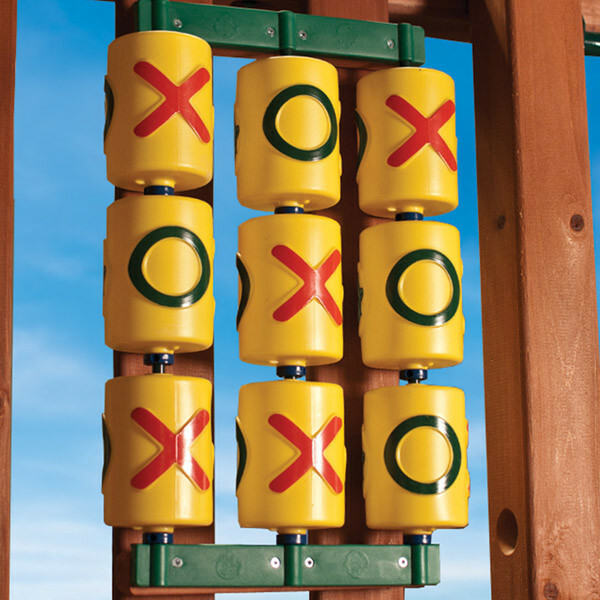 All of these features come ready to assemble in this unique wooden playset. The main beams are all pre-drilled along with all of the lumber being pre-cut, pre-stained, and pre-sanded. The 3D instruction manual gives detailed step-by-step instructions for ease of assembly. 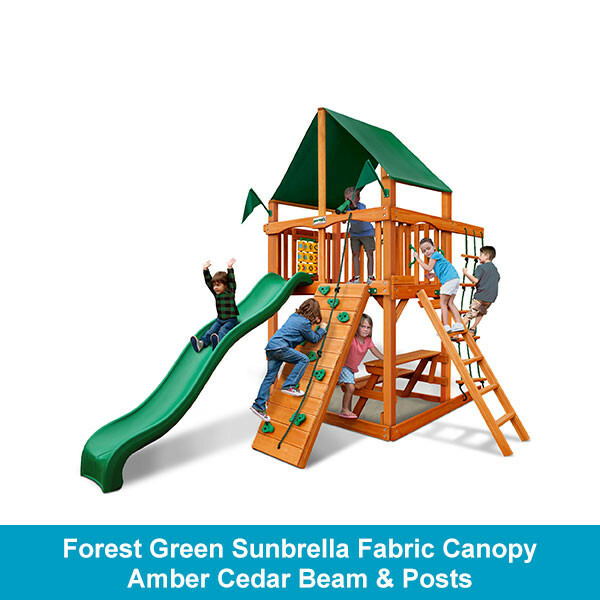 Customers who purchase this swing set also have the choice between a wood roof, green vinyl canopy, or a Forest Green Sunbrella canvas canopy. When ordering please choose the Amber Cedar option. 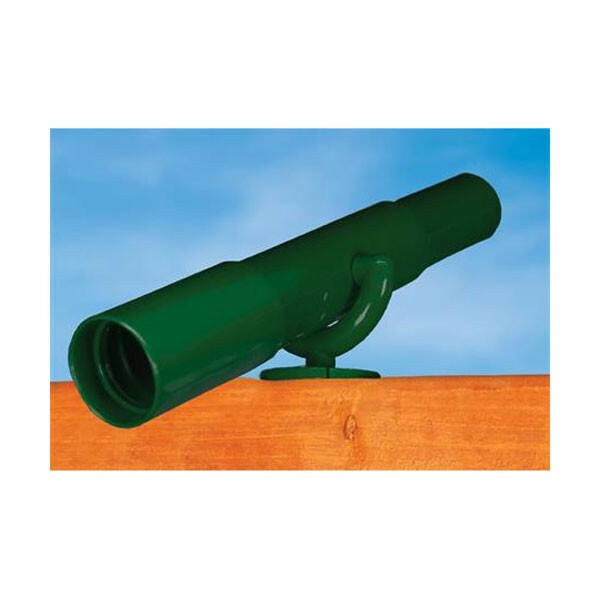 The Timber Shield Coated option has been discontinued. 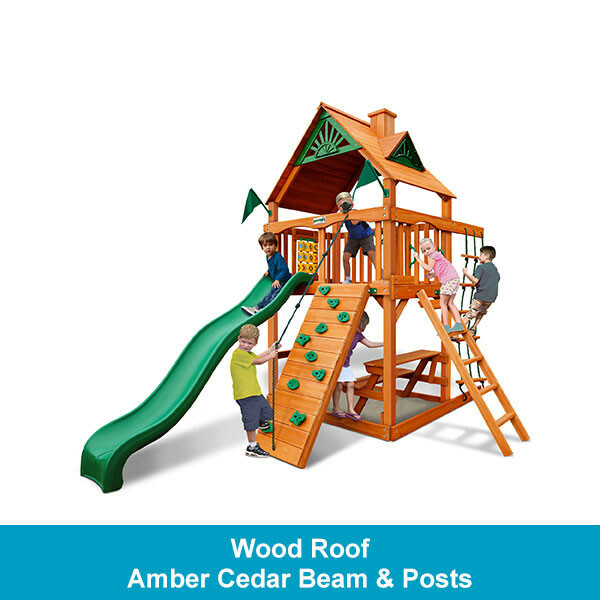 Amber Cedar Beam & Posts – The entire swing set including the swing beam, swing beam legs, and corner posts are solid cedar with an amber colored stain. Sunbrella™ fabric is an ideal choice for use in outdoor environments because it is extremely durable and easy to clean. That is why it makes a great choice for a roof on our quality wooden Gorilla swing sets. Not only it is durable enough to last 2-10 times longer than other fabrics, it also resists stains and fading. Sunbrella fabrics are infused with UV stabilized pigments to keep them strong and vibrant, even when exposed to harsh sunlight. 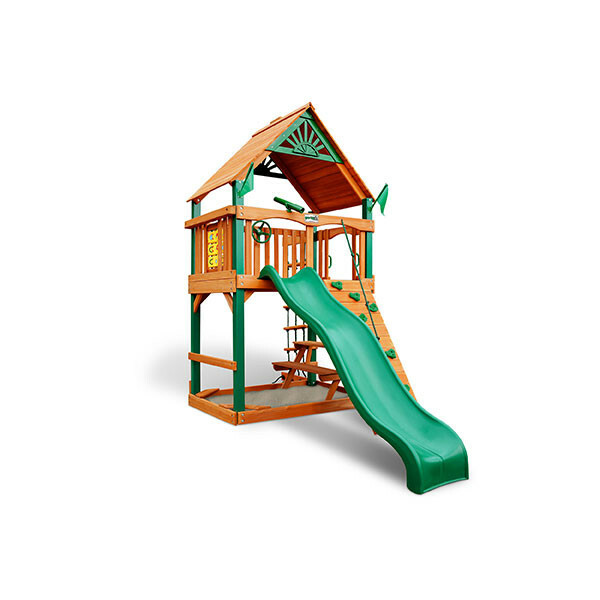 This Gorilla playset comes with a vibrant Forest Green canvas canopy. Learn more about Sunbrella by clicking here. Once you have ordered your Gorilla Playsets swing set it will ship in 7 - 10 business days. Gorilla Playsets accessories ship in 3 - 7 business days, once shipped your order will take an additional 3-5 business days to be delivered. These times are not guaranteed and are subject to change. While some smaller accessories ship via UPS, most Gorilla products are delivered through a second-party freight carrier. Free delivery only applies to standard delivery and products can only be shipped to the lower 48 United States. Play sets cannot be delivered to a PO Box. Your swing set and accessories will first be delivered to a freight carrier who will then contact you to set up a curbside delivery time. Freight and delivery are all included in the purchase price. To insure the delivery of replacement parts or returns, it is important that you inspect your purchase upon delivery and report damages to the driver. Your Gorilla Playset comes with a 10 year warranty that states under normal conditions and use they will repair or replace any parts that have defects in the workmanship or materials. The 10 year warranty applies to structural wood components while all other parts including plastic, tarps, rope ladders, and hardware are under warranty for 1 year. Defects that are naturally occurring due to climate exposure or deficiencies in the wood that do not affect the swing set's structural integrity are not covered under this warranty. The warranty also does not cover defects that occur due to improper or faulty installation. Your swing set was designed for use at a residential, single-family dwelling. If it is used for any other purpose than which it was designed such as commercial or institutional use, this warranty is not valid. At Gorilla Playsets the customer comes first. 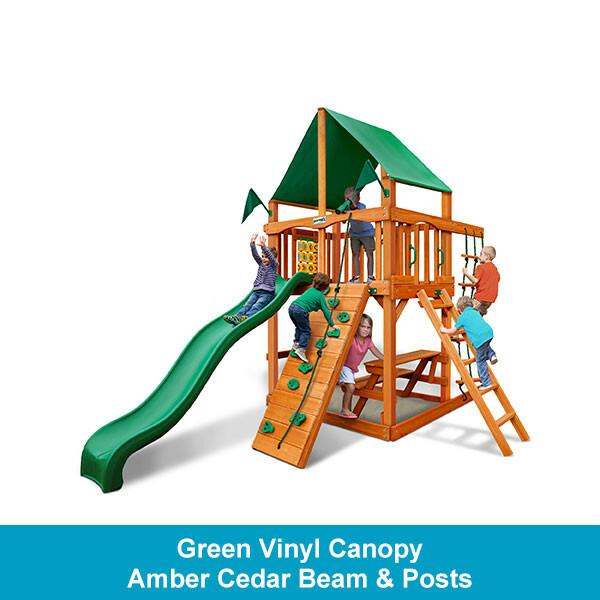 They have been designing ready to assemble playsets since 1992 and strive to provide products that are high-quality, safe, and affordable. All of their swing sets and accessories were creatively planned to provide a fun experience for children and peace of mind for their parents. 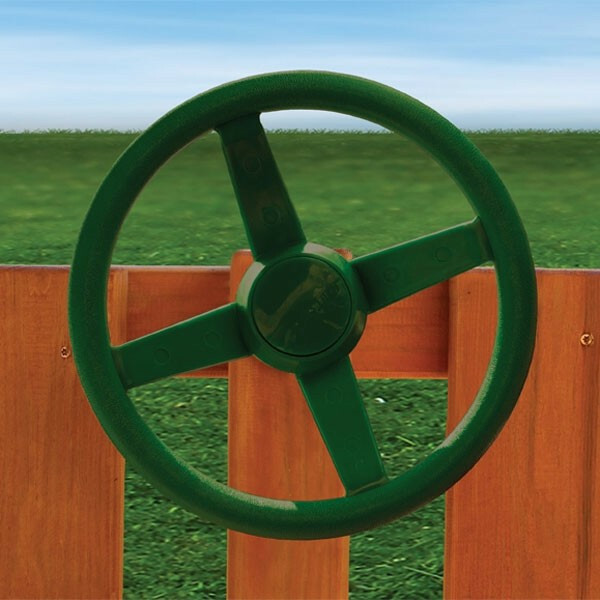 Each product is built with sturdy wood components, durable metal or plastic accessories, and all the necessary hardware and easy-to-read instructions needed for assembly. Gorilla is known for their outstanding customer service and attention to detail, making them a top name among kids and families.